These well recognised and vital qualifications within the education industry provide a pathway for candidates to understand assessment and internal quality assurance and, if required, qualify as an assessor or IQA. Candidates who wish to achieve these units could be assessing or quality assuring competence or non-competence based learning, knowledge or skills in an environment which delivers NVQ or work-based qualifications, apprenticeships or other classroom based programmes. Working together, we will select the units and qualifications that best meet the requirements of what they are assessing or quality assuring. At Crown Vocational Training, we will work one-to-one with candidates at the outset to establish the existing level of skills and knowledge enabling us to set up an Individual Learning Plan that is tailored individually to the candidate’s needs. Regular assessments are then carried out with the candidate-assessor/IQA in their place of work over a period of 6-9 months, depending on the availability of suitable assessment opportunities. It's aimed at those individuals working within the training sector either with the delivery of vocational or classroom qualifications including apprenticeships. 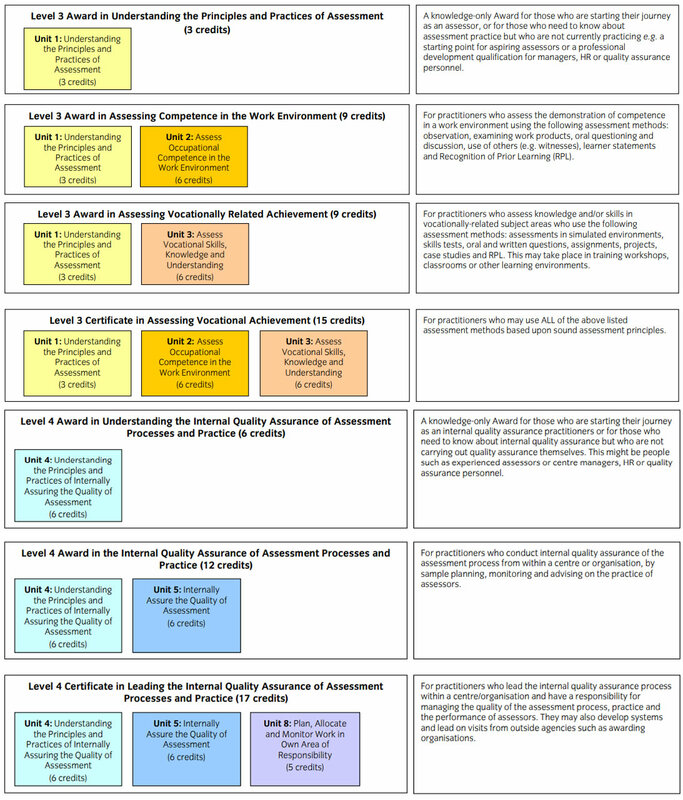 For those assessing vocational competence, the assessor award (level 3) is the appropriate route. Following the induction period and initial skills assessment, the length of the programme is determined by the availability of assessment opportunities within the candidate's workplace as there are a fixed number which have to take place. This typically can be completed within a 6-9 month timeframe. The fully inclusive cost of the course is £795.00 which includes all of the training materials, awarding organisation fees, assessment costs. What courses can I progress onto following this? For candidate's completing the level 3 award for assessors, they can progress onto the level 4 quality assurance qualification. For both qualifications, completing candidates should consider completing the Level 3 Award in Education & Training which is aimed at those who deliver learning to individuals.